Signs - affected plants may turn yellow, wither and die. Small plants and seedlings may be severed at ground level. The grey / brown leatherjackets are up to 3.5cm (1 1/2inches) long, smooth, tubular and legless, rarely seen above ground, usually found just below the surface particularly in grass where a small population that causes no visible damage is more common than not. Damage - feed on roots particularly affecting young annuals, bulbs and vegetables, predominantly affects land that has been recently brought into cultivation recently and usually subsides after a couple of years. The leatherjackets are the larvae of crane flies, daddy-long-legs. On lawns, more damage is usually done by birds and small mammals digging the leatherjackets up than by the leatherjackets themselves. Treatment - the traditional way to bring them to the surface is by soaking an area of lawn with water and then covering with black plastic sheeting (weighted down) or sacking. Leave for a day then lift the cover and remove the leatherjackets. Put them on a bird table - the birds love them. Whenever I've been lifting turf to establish a plant border or bed, leatherjackets are invariably uncovered. I've always had a companion blackbird or robin who will sit to one side, then when I walk away briefly from the bit I've just uncovered will dart down pick up a grub and re-position itself for the next swoop. Sometimes, if they're a bit braver and closer, you can pick a grub up and throw it to the bird. 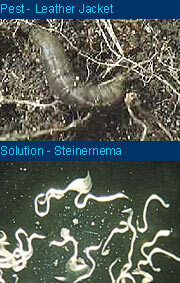 The biological control for leatherjackets is the predatory nematode Steinernema feltiae. It will not control all leatherjackets but can reduce numbers which in turn will reduce the damage to grassland and turf. Apply between March and June when soil temperature should be + 12 Â°C, later in heavy soils, earlier in light soils. Have a cute children's story-book name. Look like they were designed by a cartoonist with ludicrously long legs that allow them to fly in a stately fashion while often crash landing in an amusing manner - you need to look carefully. Belong to the Diptera - the true flies, that have one pair of functional flying wings while the second pair is reduced to small "halteres" like little knobs on sticks. This small pair spin around furiously in flight and act like a gyroscope touching tiny, sensitive hairs around them if the insect changes direction so providing in-flight feedback about direction of flight, attitude, acceleration etc. I've always thought that was cool. A. In spring time, the best way to deal with leatherjackets is to soak the grass with water (requires no effort if your weather's like ours!) and then lay sacking or black plastic weighted down onto the grass. This will bring them to the surface. Either you go and pick them up and remove them, or do something like throw bits of bread high in the air to attract the birds who will come and do the job for you.